MEF Special Report: Day One of the University of California, Irvine's, "Palestine Liberation Week"
On March 7, the UC Irvine Muslim Student Union kicked off its week-long "Palestine Liberation Week." The first speaker was British freelance journalist Ben White, author of two books condemning Israel for its "maltreatment " of Palestinians (both received rave reviews from Iran's Press TV). A small crowd of about fifty people were on hand. Even White's supporters in the audience looked bored. He spoke again Monday evening--double punishment for the MSU members who feel obligated to come out and support the event. White delivered an off-the-shelf speech about the "injustices" Israel commits against the Palestinians. He complained of the controls on the movement of Palestinians but did not, of course, dwell on the possible reasons for such restrictions: Palestinian terrorism, suicide bombers, rockets lobbed into Southern Israel from Gaza. Rather, he attacked Israel's control of goods allowed into Gaza and complained of the "illegal settlements" in the West Bank, but never mentioned the murders of Israeli settlers by Palestinians, including the slaughter of the Fogel family in 2011. In the question and answer session, I reminded White of his previous speaking appearance at UCI in 2010, when a female audience member questioned him about the then-recent murder of an Israeli family living in one of the West Bank settlements. At the time, White dismissed the murdered Israelis as "illegal settlers." The woman responded that they were "Jewish human beings," at which point, White said, "OK. They were illegal Jewish human being settlers." 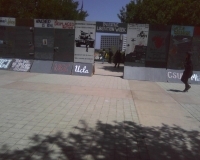 I then told him that since he had been at UCI, there had been another murder of an Israeli family, the Fogels in Itimar. I described the murder of five people, three of whom were children--including a months-old infant in its crib whose throat was slashed. I noted that many Palestinians to handed out candy in the streets in celebration. In response, White drew a moral equivalence between the deliberate murder of innocents and inadvertent killing during war, stating, "I condemn all murder of innocents," but comparing the murders to the death of innocents killed in Gaza by Israeli airstrikes. He didn't condemn the Palestinian militants' use of civilians as human shields. White is a typical anti-Israel activist, speaking endlessly of Israel's so–called "crimes," but never mentioning the atrocities committed by Palestinians or Arab states. Monday evening, British journalist Ben White made his second speaking appearance at UC Irvine on behalf of the Muslim Student Union. Intending to discredit Israel as a democracy, claimed that the Israelis have a long history of denying basic rights to Palestinians living inside Israel. To accomplish this, he took out of context statements by Ariel Sharon, Shimon Peres, and others who defended Israel's identity as a Jewish state, complained about Palestinian housing in the Negev, and gave a one-sided presentation of Palestinians who landed in refugee camps after the 1948 war. White's comments amounted to a one-sided, simplistic presentation of a complicated conflict. As he did in the afternoon session, White engaged in a selective reading of history. He neglected to mention the terrorist threat the Israelis faced from the Palestinians during and after the 1948 war or the plight of Jewish refugees, some 600-800,000 of whom were driven out of Arab lands. In the question and answer session, I pointed out this omission and called attention to the plight of religious minorities in the countries surrounding Israel. I also asked him to acknowledge that Jews driven out of Arab lands in '48. He responded that it was irrelevant to the subject of Israel's transgressions, but did state that everyone on both sides who lost their homes and possessions should be given compensation.